Assumed office on 2nd Feb, 2007. Previously he was a Reader in the Department of Physics, City College, Kolkata and Lecturer in Physics, Ramkrishna Mission Sikshamandir, Belurmath. He maintains interest in a variety of subjects especially educational administration. 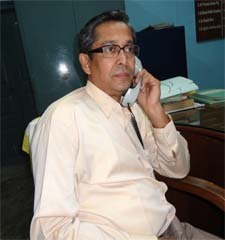 He is a member of the Executive Council of the West Bengal State University, Barasat. I warmly welcome all to the website of our college Mrinalini Datta Mahavidyapith. This web-site provides information regarding the institute, its teachers and the courses as offered by our college. Also, it shows how the college maintains a palette of academic, cultural, sports and personality development programs designed to cater to the needs of the students. We have qualified, trained, motivated faculty members who make this college worth experiencing. Our college believes in continuous up gradation and development of teacher-student interaction through formal and informal academic interactions; infact it motivates its students to move forward in their search of identity and future prospects. Stagnation is one word that every person associated with our institute strongly condemns. Being situated at the north eastern peripheral location of the city of Kolkata, our basic aim is to provide all kinds of academic support to our students who belong to the remotest areas of the district of 24 North Parganas and beyond, so that they may proceed further in their journey of self establishment.